Promotional heat packs are a wonderful invention. Whether it’s in the cold autumn and winter months or you simply need to warm up your hands or treat aching or arthritic joints, back pain or sports injuries, these hand warmers are ideal giveaway items. They can be easily branded and printed with your logo. These hot products can be used as advertising giveaways as part of a general wellbeing marketing campaign with a travel or health theme or at outdoor events, cold weather and winter sports activities, or exhibitions. The thing with hot packs is that they will not only be kept but re-used as they are easy to prepare for re-use and can easily be carried around in a pocket or bag. Hand warmers once activated can be moulded into shape and placed exactly where the warmth and their heat is needed. An alternative product is a cold pack and we also supply these for promotional marketing as well. 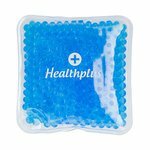 Promotional ice packs can be used to treat pain and reduce swelling, treat sports injuries, headaches, toothaches, insect bites and bruises. 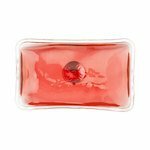 Please have a look at the heat packs and ice packs in our collection. Each product comes with instructions on how to reactivate once used. The pack details also show the specifications, colour and print options and imprint areas. If you cannot find the promotional hot or cold pack that you need please let us know. We have an extensive supply chain and can offer alternative models. Our in-house Design Studio can provide virtual visuals showing how your logo would look on the packs as an imprint. We can also send you samples of hot and cold packs that have been completed for other marketing campaigns. How do hot packs help muscles? When you activate a hot pack you can then apply the product to a muscle. The heat will help to dilate blood vessels and promote blood flow which will help to relax tightened muscles and promote healing. Always refer to the instructions supplied with a heat pack for more detailed advice and any precautionary measures that should be taken. How do hand warmers generate heat? Hand warmers and packs rely on an exothermic reaction which is one which occurs when two chemicals or substances come into contact with each other to produce heat. Heat packs can generally be reset by placing hot water. Please refer to the individual heat pack products for more information and always follow the instructions. How can you brand a hand warmer? The hand warmers we supply have a defined imprint area or allow us to print the entire area of the pack product itself. Please refer the individual products for more details on print areas and methods.